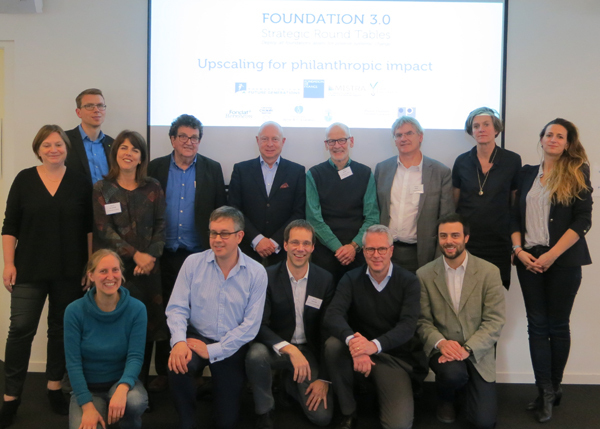 This seventh meeting was held on 2 and 3 February 2017 at the Philanthropy House in Brussels and was facilitated by Barry Knight (Executive Director, CENTRIS and advisor to the Global Fund for Community Foundations - UK), an expert in the field of evaluation and knowledge management. The aim of the round table was to encourage foundations to think about how, when they have developed an approach that works, they can extend it the benefits much more widely. It is important that we can find a way to do this upscaling if foundations want to have a positive impact on the big societal challenges that we face in education, health, housing and other spheres. The question is how can we do this? The interactive workshop has allowed participants to share good practice and learn from each other. To stimulate these discussions, there have been rich and diverse contributions from five foundations that have successfully scaled up their efforts in different ways. Participants heard about how this has happened in diverse spheres including primary education, healthy eating, climate change, palliative care and business as a force for good. Sophie Lasserre, Programme Manager, Fondation de France discussed a programme to develop a system of palliative care. This has involved many interventions and investments over a 25-year period resulting in comprehensive system change. Jan Despiegelaere, General Coordinator, West Flanders Community Foundation presented "My Machine" as an innovative experiment with young children in school that has taken off and been applied in seven locations across the world. The work has the potential to develop a more creative approach to education. Marcello Pallazi, Founder and President, Progressio Foundation & Co-Founder, B Lab Europe presented how B Corp is becoming influential in using business as a force for good, as a certification, management tool, new legal entity and a fast-growing 6,500+ companies community. Foundations have been pivotal for the B Corp movement to bloom worldwide. Isabelle Le Galo, Deputy director for Spain, Fondation Daniel & Nina Carasso has set out a highly successful programme to improve children's diet. Based on attitudes, food habits and exercise, 25,000 children participated in 2014-15. The programme is being evaluated scientifically. Bevis Gillett, Polden Puckham Foundation and Mark Campanale, Founder & Executive Director Carbon Tracker shared the story of Carbon Tracker which helped to bring the term 'stranded assets' into the mainstream of global economic thinking, winning the Guardian Sustainable Business Award for Innovation in Communicating Sustainability in May 2014 and in May 2015. The work enables a climate secure global energy market by aligning capital market actions with climate reality.